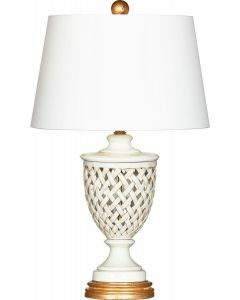 Add sophistication and style to any room with the Amelie Blanc Couture Table Lamp. Its soft Gilt Alabaster Empire shade is made of Shantung Silk and features a hand sewn open box pleat with British braid that’s sure to impress. This lamp measures 31”h; shade measures 10.5 inch Top X 18 inch Bottom X 12 inch Side Measure. Click on images for greater detail.